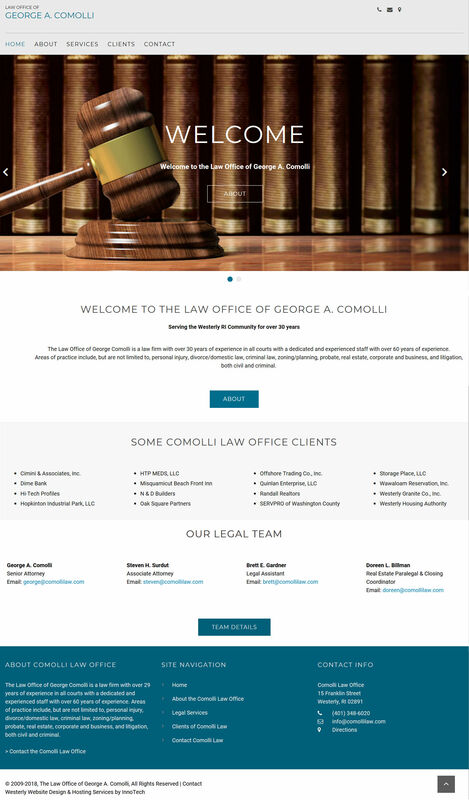 01-Sep-2018, WESTERLY, RI: InnoTech of Pawcatuck, CT, has announced the completion of a website redesign project for one of our long time clients, The Law Office of George Comolli in Westerly, RI. The Law Office of George Comolli is a law firm with over 30 years of experience in all courts with a dedicated and experienced staff with over 60 years of experience. Areas of practice include, but are not limited to, personal injury, divorce/domestic law, criminal law, zoning/planning, probate, real estate, corporate and business, and litigation, both civil and criminal. Comolli Law is a long time customer of InnoTech and we are proud to launch this modern, mobile-friendly website for this client. InnoTech was responsible for designing, implementing, and deploying this new, mobile-friendly website. We will now provide all on-going maintenance of the website, as well as domain name management of all the associated domain names. Lastly, InnoTech will also provide hosting and administration for the email accounts used by Comolli Law.